The beginning of a new year often puts us in a position of making big decisions. We are refining strategy plans, setting business objectives, and determining what changes we want to make, both personally and professionally. Do we make that move to put the kids in a better school district? Should I promote the internal candidate or hire someone? Is now the time to make an organization change? In business, we are paid to make decisions. It is such a critical skill, yet it’s not a subject in the standard school curriculum. That is why I found the latest book from The Big Idea Club so beneficial. It’s Farsighted – How we make the decisions that matter the most, by Steven Johnson. In this book, the author considers research from social psychology, military strategy, cognitive science, behavioral economics, and environmental planning. He makes a compelling case for why we would benefit from a more deliberate and creative approach to decision-making. Generate multiple options – We often consider THIS vs THAT, limiting the arguments to being for or against a decision. Often the best outcome isn’t a simple yes or no, It’s more about looking at possibilities. Assemble a diverse team – Avoid bringing people together who think like you. Diverse groups are collectively smarter than homogenous groups. Bringing a diverse set of perspectives and experiences to the table results in innovative ideas to solve complex issues. Use stories to unlock new ways of thinking – Steven talks about two ways to use stories to help you make decisions. 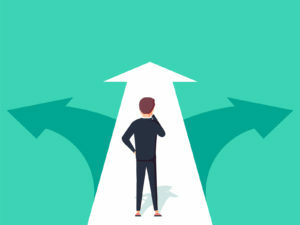 Scenario planning – When faced with a choice, try to imagine a multiple version of what the long-term consequences will be. 1) a story where things get better, 2) a story where things get worse, 3) a story where things get weird. This third option forces you to explore different possibilities. When you review the three versions of the story, you can refine your predictions and formulate a decision. Conduct a premortem – Imagine a failed outcome and then create stories about HOW that failure happened. Where did you go wrong? The stories help you see potential problems and how those choices result in disaster. Weigh the values – This is a robust form of the pros and con list. Here’s how it works. When faced with a decision with multiple options to consider, create a list of the values that are important to you. For each value, give it a numerical weight of how important it is to you, from 0-1. For example, if you were offered a promotion that would require relocation, what values come into play? Values like: Career progression, more money, more responsibility, stability for the family, (new school, leaving friends, community connection…), access to outdoor recreation, affordable housing, etc… With the values weighted, turn to the choices – 1. take the promotion OR 2. decline the promotion), and grade each option on a scale of 1-100 in terms of how well it addresses your values. Now, multiply each grade by the weight of each value and add up the numbers for each choice. While these are methods to use in decision-making, let’s not underestimate the importance of that gut instinct. These methods are simply intended to supplement our intuition and help you make smarter choices. Try one or all of these in your next big decision and see what works for you.